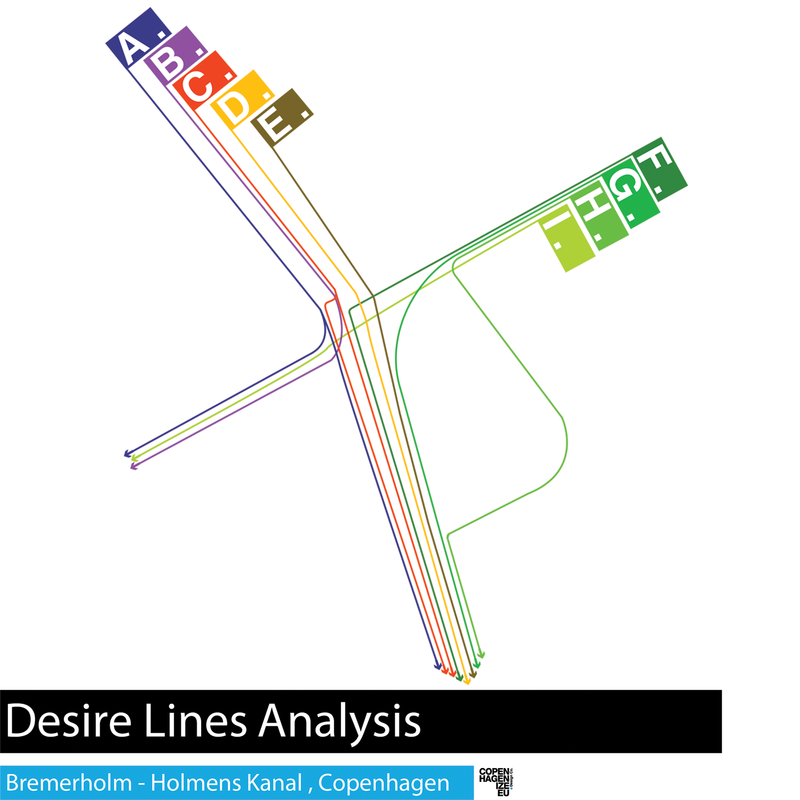 Continuing in our series of Desire Line Analyses, we decided to cast our critical and curious eyes on yet another Copenhagen intersection, this time where Bremerholm meets Holmens Kanal. We decided to be more specific and focus on one part of the intersection - a location that we know well and one with a specific congestion problem in rush hour. We filmed for one hour from 08:15-09:15. With the massive numbers of bicycle users in the mornings in Copenhagen, bottlenecks occur at a number of locations, particularly where many bicycle users need to turn left. This is something that all of us at the company experience each morning so we decided to study it. It was a November morning and it was party-cloudly, dry and 6 degrees C. The focus was to determine how bicycle users react to the sub-standard design of this location. How they react to having to battle with motorised traffic - something that is unusual in the city. Yep, even in Copenhagen, The Arrogance of Space is present at times. 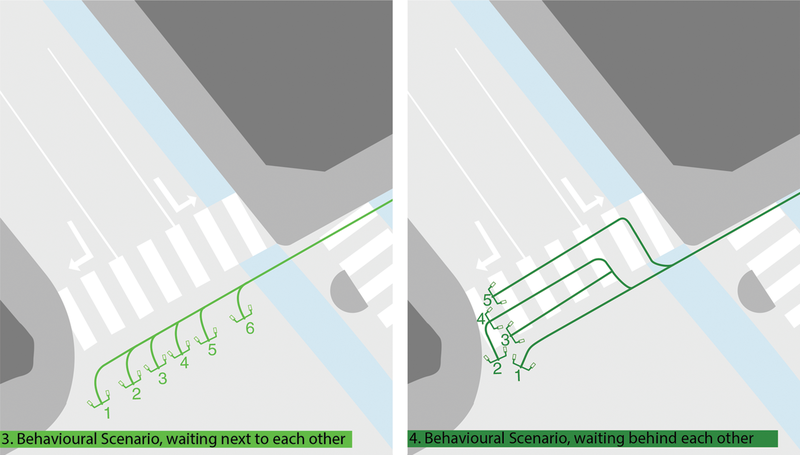 With this study we look at how bicycle users react to the design of infrastructure at one specific location, their behaviour and adherance to traffic laws and how they interact with other traffic users, in particular cars. All in one tight, congested location. As always, we apply Direct Observation and Revealed Preferences, as opposed to Declared Preferences in order to explore how to improve conditions for bicycle users in the interest of improving flow, capacity and safety. Here is the map of the intersection in question. 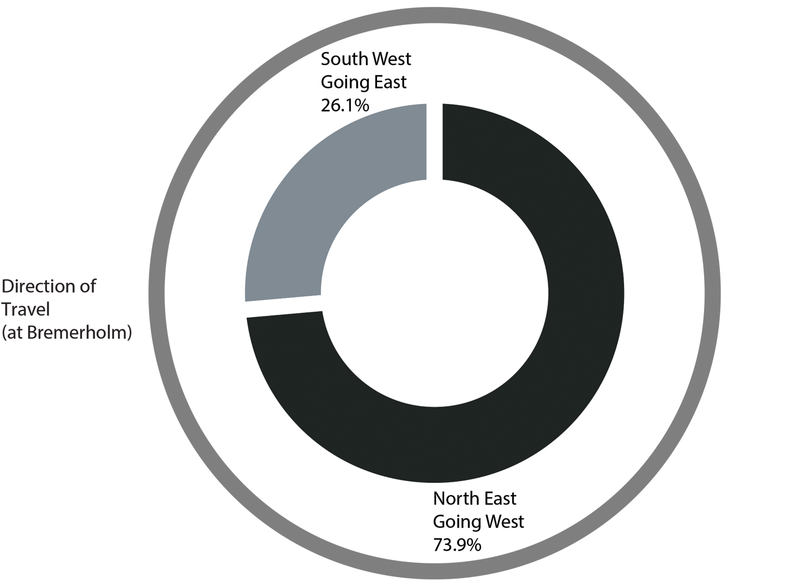 This short analysis revealed quite a lot of interesting revelations in the behaviour of the bicycle users. 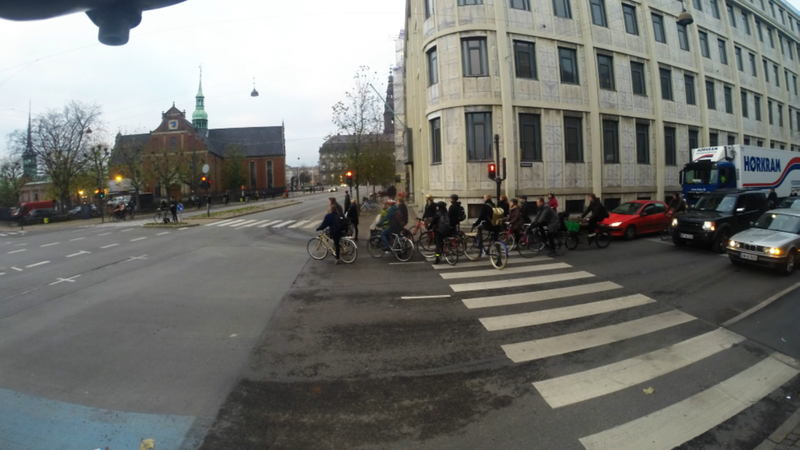 We have established that Copenhagen has the world's best behaved bicycle users. We wondered if that track record would stand the test at an intersection that is far below the Copenhagen par in its design. 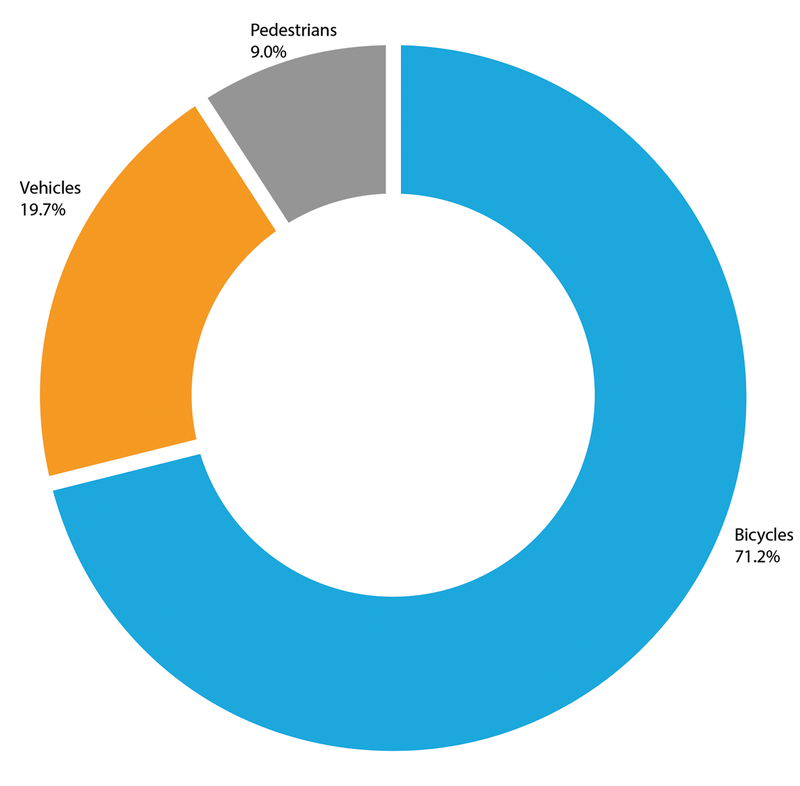 71% of all traffic in the observation period were bicycle users. 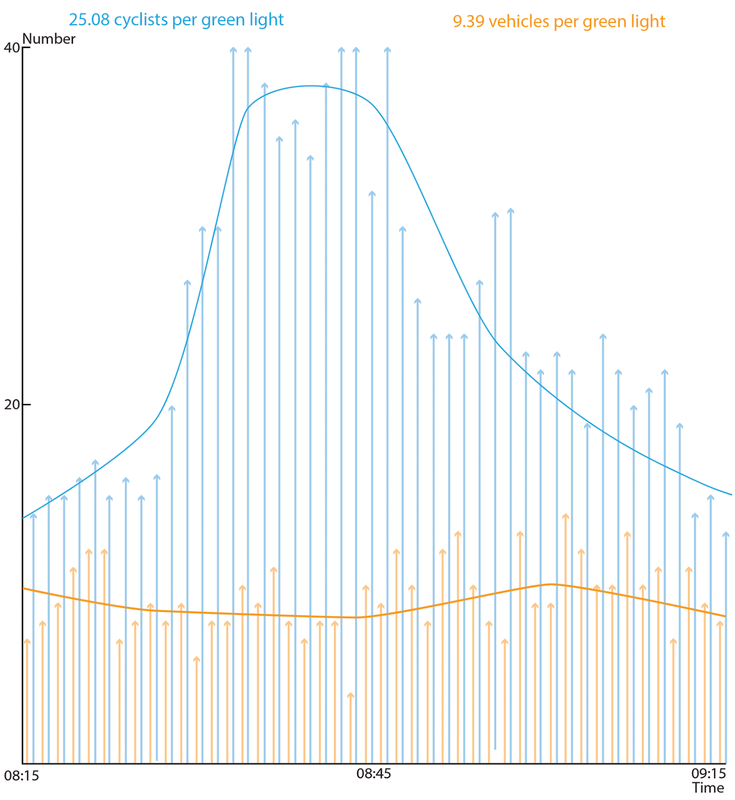 86% of all left-turning bicycle users observed performed the textbook Copenhagen Left. The majority of those who didn't were reacting to the congestion. 1:3 - For every vehicle there were three bicycle users. Imagine if they were all in cars. This might jog your memory. 1560 - This Desire Line analysis mapped the Desire Lines of 1560 cyclists on their way to work or education during morning rush hour at the Bremerholm - Holmens Kanal intersection. During the morning rush hour, the intersection is characterised by congestion at the corner with bicycle users waiting for the green light. 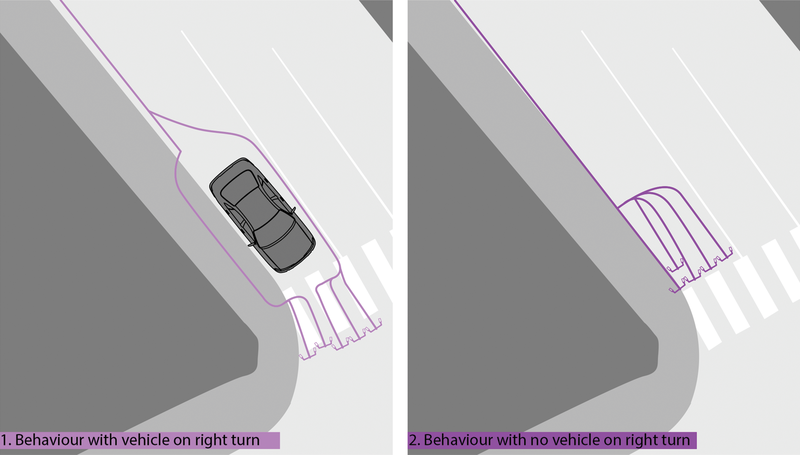 The traffic law dictates that the Copenhagen Left - or the box turn - is required. Bicycle users are not, however, required to wait for the light to turn green. They can cross if there is no traffic. Two main behavioural patterns were observed. 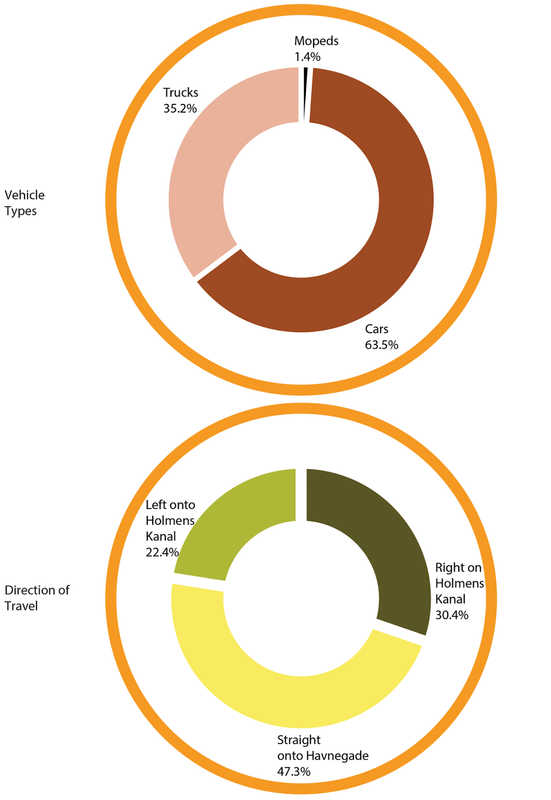 The first where bicycle users are turning left in great numbers and also how bicycle users coming down Bremerholm interact with motor vehicles upon reaching the light. These two scenarios interacted with each other, and should not be considered to be mutually exclusive events. Here we see how bicycles and vehicles interact inside the same space. At this location, the bike lane ends before the intersection and bicycle users share the space with right-turning cars. This design was standard for a few years, but now pulling back the stop line for cars at intersections is the new design approach. The general rule of thumb is that whoever gets to the intersection first - be it a car or a bicycle user - can decide to hug the curb. Cars invariably hugged the curb, leaving - at this location - no space for bikes. Because of their expectations due to the uniformity of design elsewhere in the city, bicycle users invariably found a way of getting ahead of the cars at the red light. It was interesting to observe how bicycle users waited at the light when turning left. It had little to do with the volume of bicycles but rather the behaviour of those who arrive first on the scene. The following bicycle users invariably followed their lead, either lining up across the intersection or bunching up behind them. 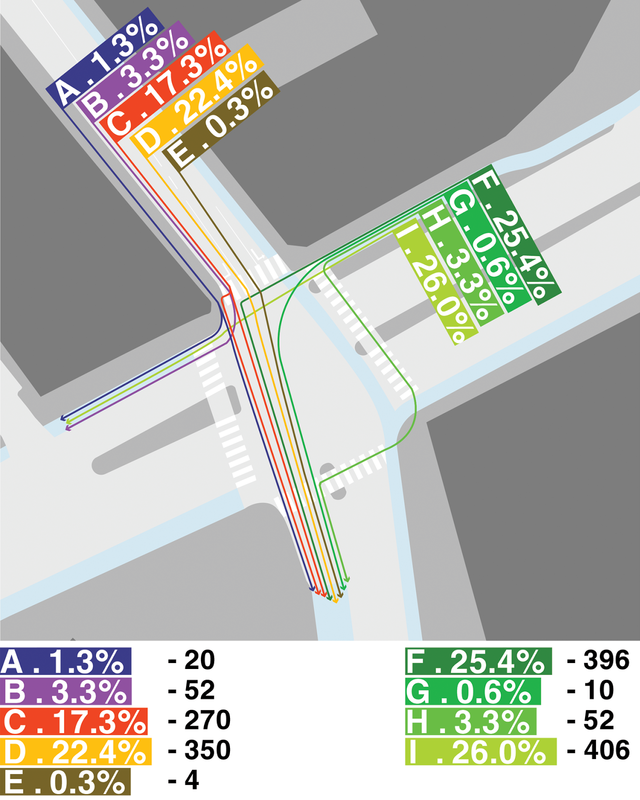 Further data and observations were gathered from this Desire Line analysis.The data of each of the different forms of traffic was then broken down (shown below). The observations of the cyclists. Vehicular data was broken down. It was interesting to note the flow of traffic per traffic light turn and compare the flow of bicycles to cars. While the flow of vehicles remains rather constant at 9 cars per green light over the morning rush hour, the flow of bicycles varies greatly. This demonstrates that bicycles can get through an intersection quicker than vehicles do. 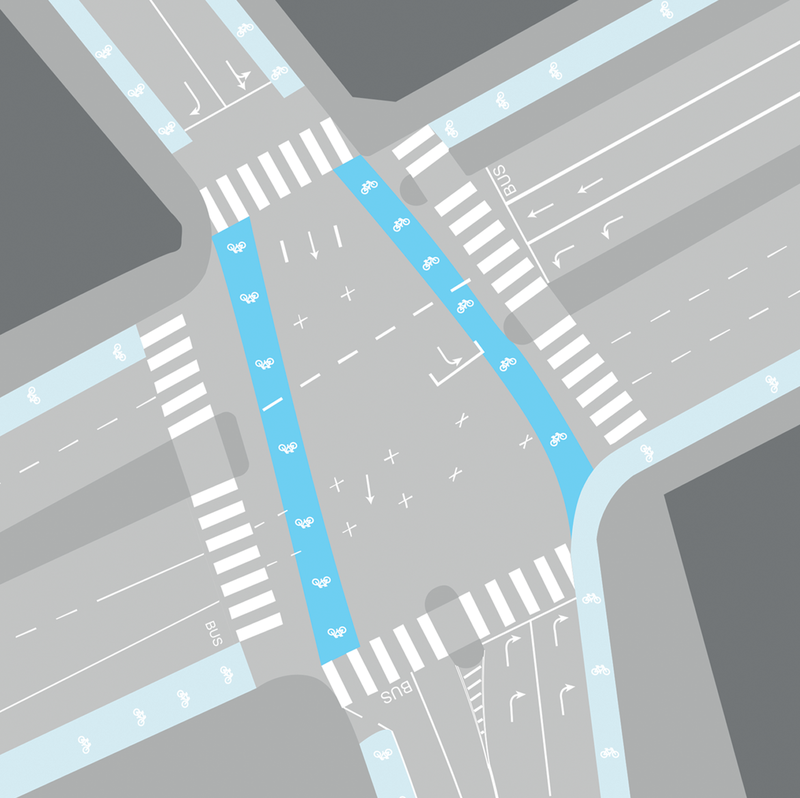 Finally we offer our recommendations for redesigning the intersection. When the vast majority of the users are on bicycles, democracy would indicate that there are easy redesigns available to prioritize them. Read the full pdf from the Copenhagenize Design Company website.